Universities in England should have no upper limit on tuition fees, Lord Browne's review is set to recommend. But government support will only be guaranteed up to a maximum of £7,000 per year - which is likely to make this the upper fee for most degree courses. This would mean more than doubling the current tuition fee of £3,290. 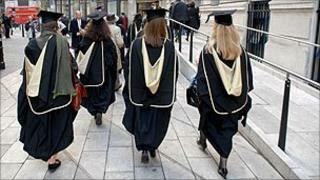 The National Union of Students said students and their families would treat such plans for higher fees with "contempt". NUS president Aaron Porter suggested that such a radical recommendation would be used as a scare tactic - so that the government could then deliver a more moderate increase. The recommendations would mean a three-year degree typically costing students £21,000 or more - with many also likely to face a higher rate of interest for loan repayments. Universities UK president, Steve Smith, says that universities face such deep budget cuts in the forthcoming spending review that an increase in fees to £7,000 would only replace the money that the government is about to withdraw. "This is transferring the cost from the state to the student," said Professor Smith. The Million+ group of new universities warned that this would create a "two-tier university system, with one set of universities for the rich and one set of universities for everybody else". Lord Browne's review of university funding in England is set to deliver its recommendations to the government on Tuesday. It appears likely that it will advise ministers to scrap the current upper limit on tuition fees, introducing a market in what students can be charged. However the proposed funding mechanism will only fully underwrite the cost of fees up to £7,000 per year. Universities will be able to charge above this limit - but as fees rise above £7,000 they will only be allowed to keep a diminishing proportion of the higher charges. This is expected to act as a brake on raising fees above £7,000 - but the most sought-after courses in the most elite institutions would be expected to charge higher fees. The coalition government will have to respond to such far-reaching proposals. And senior sources have indicated that any final outcome will have to fulfil two main criteria - not to deter poorer students and not to increase the financial burden on the Treasury. Business Secretary Vince Cable has already emphasised the importance of a "progressive" element to the student funding deal. This could either come in the Browne report or in the government's response - and could mean that higher-earning graduates will pay back their loans at a higher rate of interest. Transport Secretary Philip Hammond, speaking on the Andrew Marr Show, said this could mean "those with the lowest incomes have their interest rate effectively subsidised". But the raising of tuition fees will present deep political challenges to the Liberal Democrats. The party's MPs, including leader Nick Clegg, signed personal pledges at the election to vote against any increase in tuition fees - and any attempt to reverse this will bring them under pressure from students and their own grassroots supporters. The Liberal Youth group has already called for party members to mobilise against such a tuition fee increase. Lib Dem MP Greg Mulholland says many in his party will "oppose any attempt to raise fees in the way that has been leaked from the Browne report". Students have warned against a "betrayal" of election pledges on tuition fees - and have circulated a photograph showing Nick Clegg and his signed pledge. Oxford University students attacked the plans for higher fees, saying that Vince Cable has "slammed bankers for their role in the economic crisis and now just weeks later he is asking students to pick up the tab". The National Union of Students says the suggestion to lift the limit on fees is a tactical step towards a more limited change. "One is inclined to suspect that Lord Browne has been asked to make the most radical proposal possible in a thinly-veiled attempt to make the government response seem more reasonable," says NUS president, Aaron Porter. Labour leader Ed Miliband has reached out to potential tuition fee rebels among Lib Dem MPs - saying that he will work with anyone wanting a more "progressive" student finance system. Les Ebdon, chair of the Million+ group of universities, warned of a socially-divided university system. "Only the most socially-elite universities could charge fees of £7,000 while universities with a high proportion of students from poorer families will feel unable to charge fees at such a high level. "It is hard to see how this meets the government's stated aim of a fairer society." Lord Browne's review is also expected to announce a student charter, to ensure students get value for money, and a changed role for university funding councils.